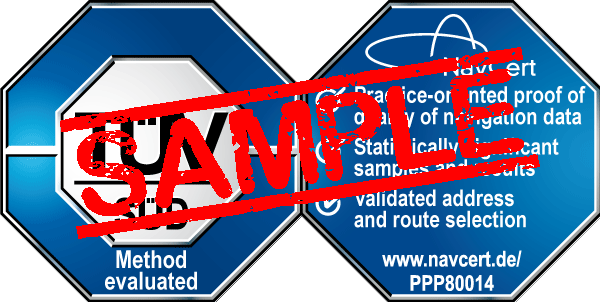 The certification mark is awarded within the framework of the voluntary testing and certification of processes supporting the assessment of digital maps. Target availability, route selection and compliance with the defined route criteria are assessed from the customer’s perspective by entering various targets and possible routes. These results will be verified by additional field tests. This approach allows for quality assessment under real-life conditions. The number of pre-defined targets and target categories is high enough to permit qualitative assessment within the scope of a statistical analysis. Gained findings permit an assessment of the submitted digital maps. All possible options for address selection are tested and evaluated during map assessment. The offered routes and their correctness are subject to verification in regard to route criteria and displayed information (e.g. distance). This occurs within field tests as well as within a simulation environment.